The January-February issue of Irish Lives Remembered magazine has been published today and is free to view or download. This edition has three main areas of geographical focus: Pennsylvania, New Zealand and County Down. Some 17 pages are dedicated to Co Down, most of them listing not only the great online collections available to researchers but also looking at offline resources at the Public Records Office of Northern Ireland, the Newry & Mourne Museum, and Heritage Collection housed in two of the county's libraries. Heading across the water, Pennsylvania looms large with a feature setting out the main resources for research in Philadelphia, Pittsburgh and the rural counties in the north-east of the state; a study of Labour Rights leader Terence Vincent Powderly whose parents emigrated from County Meath; a look at the records of immigrants – many of them Irish – who worked for the Lackawanna Iron and Coal Company in Scranton; and an exploration of Joe Biden's roots via Pennsylvania back to Co Louth. Going Down Under brings readers to a good number of articles relating to Irish roots in New Zealand. There's a feature providing valuable historical and geographical context for family historians new to research in the country; a how-to guide to using NZ's birth, marriage and death registration records; and an introduction to Te Ara, the state-funded online Encyclopedia of New Zealand. In addition there are three distinct articles concentrating on Irish soldiers in the NZ Fencible Corps, the Imperial Regiment and the 65th Regiment. 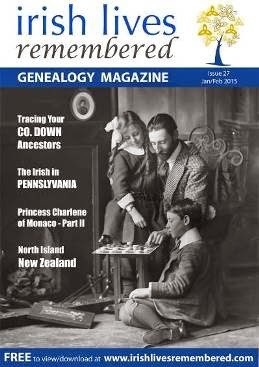 There are also features exploring recent research into the supporters, followers and descendents of The Wild Geese who left Ireland to fight in European armies, the Irish roots of Princess Charlene of Monaco (part two of three), photo analysis of a dramatic 1880s image taken in County Down, and much more.